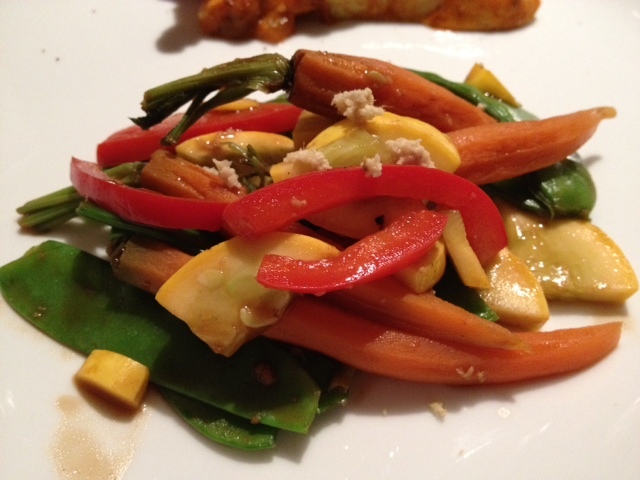 An Asian Twist on Vegetables…. Some people crave sweets, salty snacks. Me… good vegetables… I am not satisfied if my dinner does not include vegetables. The problem is variety. I get tired of eating the same vegetables. Luckily with each season comes new vegetables, yet it is difficult to find fun ways to eat them. In the book ” 75 Nouvelles Recettes Proteinees” from the Marabout Editions, there is a large selection of vegetables recipes. Some better than others. The recipe of today’s post was based on the recipe called “legumes vapeurs a l’asiatique”. Though I really like the originality of the vegetable mix, I made a few changes including the sauce. Ingredients for 4: 1 red pepper cut in thin strips, 1 bag of miniature carrots ( can be found in the packaged vegetables in your grocery store), 2-3 summer squash sliced thinly, 2 cups of snow peas, salt, light soy sauce, hoisin sauce. Trim the snow peas. Place all the vegetables in the round mold to steam them. Mix 1/16 tsp of salt with 1 tsp of water, and pour it into the round mold. Place the octogonal silpat on top of the round mold and microwave for 5 minutes. While the vegetables are cooking, mix 2 tsp of light soy sauce with 2 tsp of hoisin sauce and 1 tsp of grated fresh ginger. Pour this mixture into the cooked vegetable and mix well to coat. Et voila!! !